The past two months have been hectic mainly in terms of work but also I did a bit of travelling so I had to take a short break from blogging. I really missed the blogging world though. 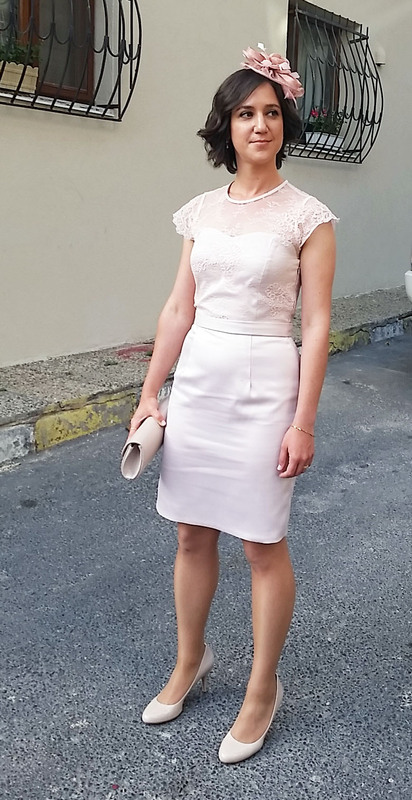 I am happy to finally have some quiet time and come back to my blog.My husband and I visited Istanbul for his niece’s wedding and now that the wedding is over, I can finally publish the dress that I made for it. As I mentioned in the preparations, I named this post the bridesmaid dress but I actually wore it at the synagogue during the wedding procession just before our beautiful bride walked down the aisle with her father. 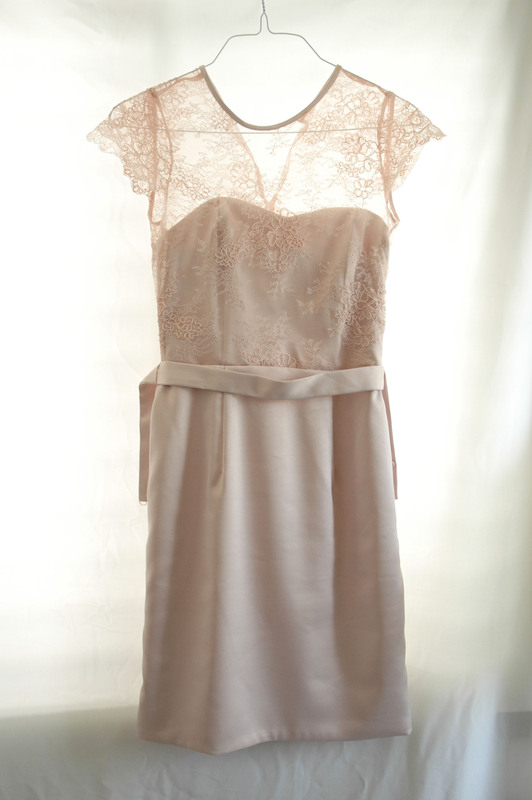 The dress did not have a complicated pattern but it took a lot of time because of the lace and some later additions. For instance, I had planned to make the skirt part of the dress without a lining and after I tried it on, I saw that fabric was too thin and I could almost see my bellybutton. Therefore, I had to sew on a lining that I had not planned before I made the dress and I had to sew most of it by hand. I think that I have never worked on a dress that required so much hand-sewing. 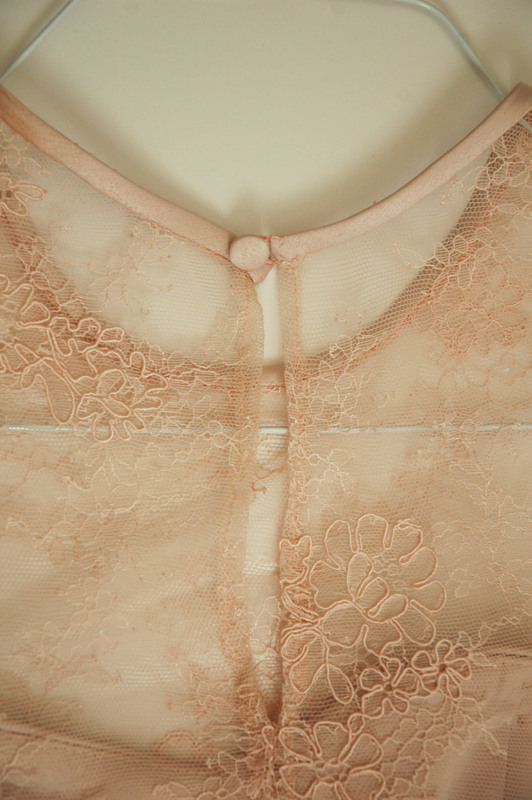 Parts of the lace top were also hand-sewn. I will not do it for every dress but hand-sewing parts of this dress which is intended for special occasions felt good and gave it uniqueness in my eyes. Also, what is nice about the dress is that it has the touch of every generation in my family. After I came to Istanbul with the dress, my mom and grandmother inspected the whole thing carefully and of course, being super detail oriented, they found parts that needed to be “corrected.” My grandmother did the button loops at the belt and my mom gave the dress it’s finally ironing. I got the buttons done from the same fabric as the dress itself. I paired it with similar colored shoes, a hand-bag and a small hat. Below you can see some photos from the day that I wore the dress. This is such a gorgeous dress! 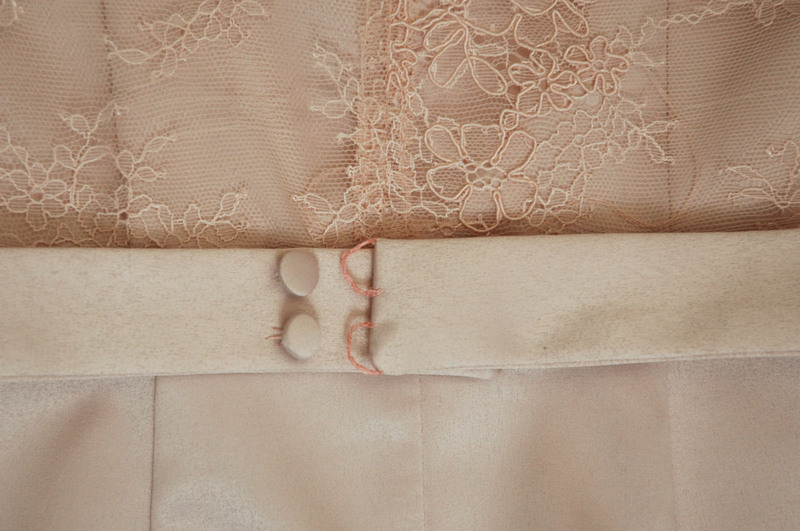 Beautiful details and a perfect fit! Hi Trish! Thank you so much! elle est magnifique!!! cest du super boulot! J’aime beaucoup… J’ai la meme robe en beige (avec bretelle amovible (je ne mets plus car les bretelle ne tienne pas, et je n’ai pas assez de poitrine pour la faire tenir…) Avec quel tissu a tu fais le haut? Merci Pascaline…J’ai utilise du ‘podange’ et dentelle sur ca. J’ai ecrit un blog sur les preparations et tu peux voir tous que j’ai utilise. Such a pretty dress! Love the lace and the colour! I have a question about the fabric (podange lycra). Is it TOO “spandexy”? Don’t you get too hot in it or does it have the general name of Podange with several possible %poly/%lycra/%cotton ratios? Thank you so much! This particular fabric was not too “spandexy” but I only wore the dress for like half a day and the air condition was on 🙂 So you are right, I think that if I wore it all day long, it would not be too comfortable. I don’t know whether you can find different ratios of cotton/lycra, it should be possible. So if it is something that you would wear let’s say for a few days, I would consider some other kind of fabric. Have fun making yours!